Sonoma County dining set is inspired by the American Arts and Crafts movement of the early 20th century. The restoration of the American Bungalow Life style combined with the casual flavor of today make Sonoma County the perfect addition to today’s home. Quality veneers over wood products and select solids are used throughout. Group may contain plastic parts. Dust proofing featured on bottom drawer. Custom hardware was developed combining mission styling with a casual feel in a heavily burnishing antique brass color. Rub through black color finish. 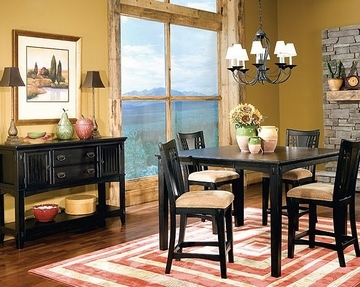 Sonoma County dining set is inspired by the American Arts and Crafts movement of the early 20th century. The restoration of the American Bungalow Life style combined with the casual flavor of today make Sonoma County the perfect addition to today’s home. The curio china has ample storage space for table side items, with 5 drawers and 3 cupboards. Glass doors and a mirror back accent decorative pieces. The functional server features 2 drawers and 2 cupboards for storage, as well as a bottom shelf. The counter height table provides a unique space for casual dining and fits perfectly in small spaces. Chairs have woven tan color fabric seat with slat backs. Decorative through mortise and tenon joints adorn each piece, highlighting the true Amercian styling of this collection.